The aim of CBUJOS is broad and individuals are invited to submit research, short communications, clinical research, lab reports and opinions in the field of Applied and Engineering Sciences. Articles are written in English are to be evaluated. All papers are evaluated by at least two referees, who are known expert in their fields. Final decision on any paper is made by the Editor In Chief. Accepted articles will be available online following the Journal's peer review process. 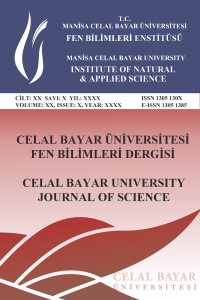 Celal Bayar University Journal of Science (CBUJOS) is a peer-reviewed open access Journal that is published four times annualy (end of March, June, September and December) by the Institute of Natural and Applied Sciences for Fundamental and Engineering Sciences Manisa Celal Bayar University. CBUJOS provides a forum for research in Basic and Applied Sciences (Physics, Chemistry, Biology, Mathematics and Statistics), Engineering Sciences (Mechanical, Civil, Food, Industrial, Electrical and Electronic etc.). It is designed for the community of internationally acclaimed scientists and researchers who study Basic and Engineering Sciences for academic, industrial, medical or environmental purposes.